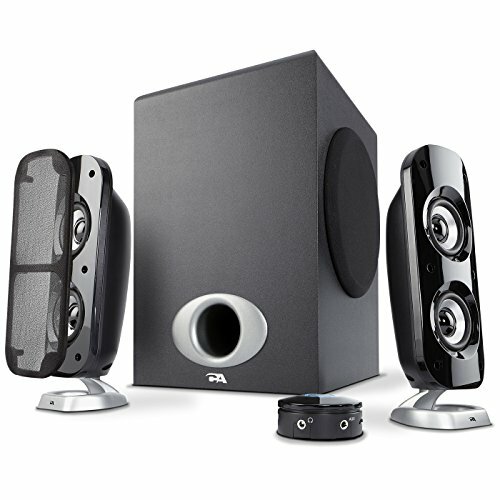 The CA-3810 subwoofer speaker system is one of our best sounding, most powerful sound systems. It delivers premium quality audio at any volume level, for that fully immersive experience with any game, music, or movie. You’ll hear quality sound you never knew you were missing before. The satellite’s dual 2 in. high-efficiency drivers deliver the clearest highs and mids, while the powerful 5.25 in. subwoofer provides accurate bass with a real kick. This speaker system comes with a convenient desktop control pod — designed to give you full control at your fingertips. The control pod has power on/off, master volume control, bass volume control, auxiliary input, and a headphone output jack. With easy set up and full 1 year warranty coverage by Cyber Acoustics, this speaker system is an awesome answer to the premium audio you have been looking for. PREMIUM ROOM FILLING SOUND: Driven by an acoustically optimized internal power supply, this subwoofer speaker system delivers 80 watts peak power and 40 watts RMS. With excellent sound and maximum power, you'll experience music you can truly feel, filling any room large or small. EASY TO USE CONTROL POD: The convenient control pod gives you full control over your sound system. Turn it on and off, adjust the master volume, or tune the separate bass volume control to get the richness of the sound just the way you like it. With easy access to a 3.5mm aux input, you can quickly connect your cell phone, tablet, MP3 player, or gaming system for an alternative sound source. Or plug headphones into the headphone jack for those private listening moments. The ported 5.25" side-firing subwoofer delivers some of the deepest bass available. When combined with our best dual 2" satellite drivers, you can expect a crisp, clean, and powerful listening experience - reliving audio performances as if you were there, live. CONTEMPORARY DESIGN: With removable cloth grills, the satellites were created to look great sitting next to today's high-tech components or discretely in a living room. QUALITY GUARANTEED: Includes 1 year hassle free manufacturer warranty. AC power 110V only. Need to update our content on this product for the latest correct information. Compatibility: Use with laptops, desktop computers, gaming systems, tablets, smartphones, DVD players and MP3 players with a 3.5mm audio output or headphone output jack. Accessories: Satellite speakers come with removable cloth grill covers for a stylistic touch or an open face look.